This section also contains 2.6.1.1.1. General rules for drawing linear items. There are general drawing and editing techniques that are used to draw places of various categories. When drawing, follow 2.6.1.1.1. General rules for drawing linear items. 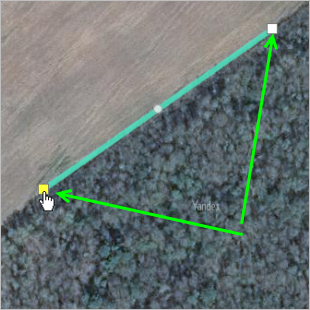 Adjust the scale of the satellite image until the item you want to map is clearly distinguishable. 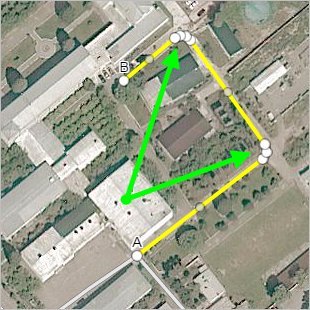 If the current scale is not suitable for drawing the item, a message will appear on the map. In this case, just increase the scale (until the message disappears). Click Create. Select the appropriate item category from the menu that appears. For example, Road . If the menu of item types opens, select the necessary type. The corresponding attribute panel will open; for example, Section of road (a partial panel is shown in the drawing). 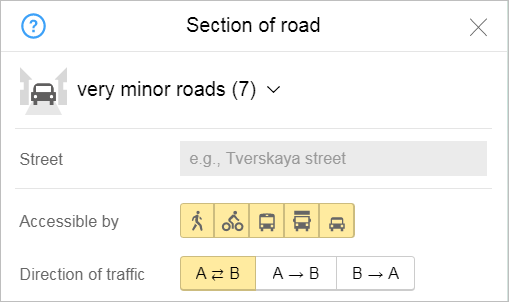 Click once to set the starting point (vertex) of the section. The starting and ending points that make up the line and the points where the line bends are called vertexes. 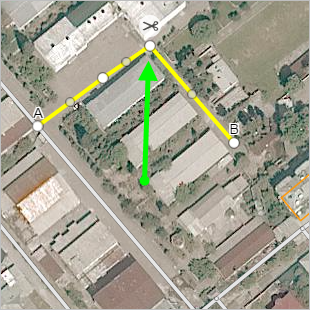 On the map, the cursor looks like a “plus sign” in drawing mode. Move the cursor to the next vertex of the section (lines between vertexes are dotted), then click on the point and choose an action. Pieces of road between vertexes are solid on the map. Every vertex appears on the map as a circle. 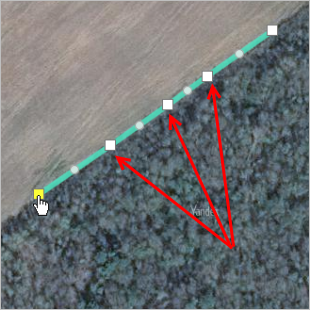 If the item is not a straight line and you need more than two vertexes to map it, then click on the spots where the line bends to set intermediary vertexes. In the middle of the two consecutive vertexes you entered, you'll see circular points that you can use to bend the line (see below). If the beginning and ending points of the line you're drawing are different (i.e. 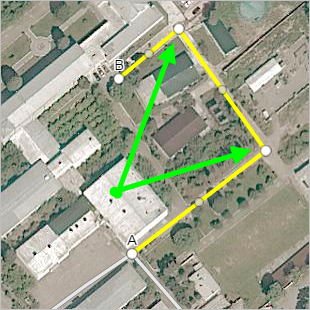 the line has a direction), then the beginning and ending vertexes will automatically be marked “A” (beginning) and “B” (ending). 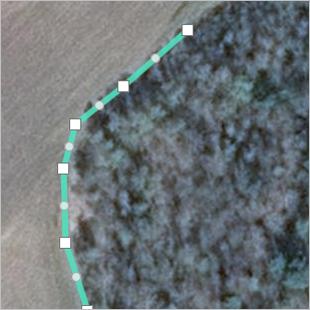 Position your cursor on any intermediary point between the vertexes (on one of the circular dots). Click on the dot (the cursor will change to a “hand”). Delete a beginning or ending vertex (from the ones that you drew) and continue drawing the item beginning with the previous vertex. Just click a vertex and select Delete in the context menu. 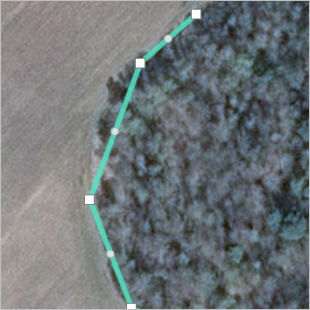 When you Delete any vertex in the middle of a segment, the neighboring vertexes will join together into a straight line. You can straighten out a piece of road this way. Just click a vertex and select Delete in the context menu. Finish drawing a map item. The item will switch to editing mode and your cursor will change back to its typical status. Then you can save the item. Just click a vertex and select Finish in the context menu. Continue drawing an item that was finished earlier. Just select the appropriate vertex in the context menu and click Continue (this only works if you clicked Finish previously). Split a piece of road at the vertex/vertexes that are currently selected. The piece of road will turn into two (or more) separate items. You may need to do this if an attribute value changes for one discrete segment. 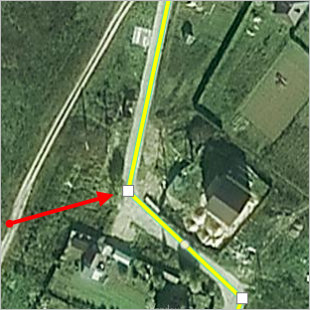 For example, the surface of a village road might be paved in some areas and dirt in others (see the “Pavement” attribute). Just select the appropriate vertex in the context menu and click Split while saving. The vertex will be marked with the “Scissors” icon ( ). When you save the item, it will split at the vertex you indicated (turning it into two different items). The icon will disappear. Unsplit an item. For example, if it was split in error (the wrong vertex was selected). Just select the appropriate vertex and click Unsplit in the context menu (this command is available for vertexes where the Split while saving option was previously available). Make angle 90° for an item you drew. Makes the selected angle a right angle (90°). 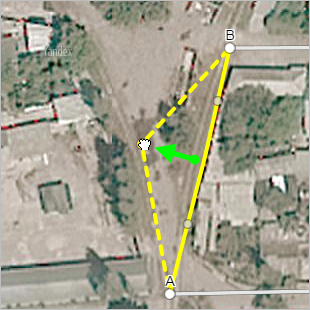 Just select Make angle 90° in the context menu for the appropriate vertex. 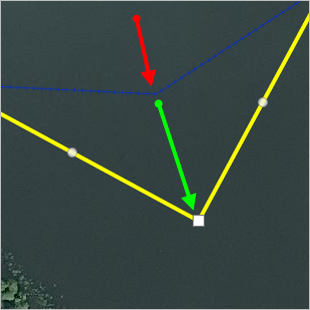 Round the corner: rounds the selected corner (by re-drawing it using several vertexes). 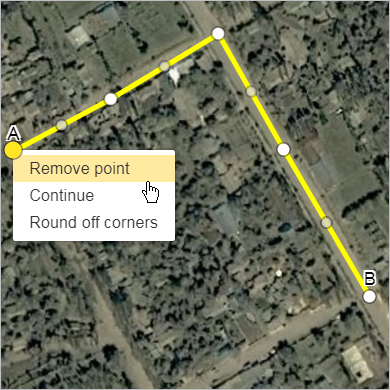 This operation is used, for example, to draw or edit sections of linear hydrographic items and sections of road (in correspondence with point 3.3.1.3.3, you should make road turns round). on the attribution panel (the drawn object is deleted). After you draw and save your item, assign attributes to it. For information on adding attributes, see section 3.1. General rules. 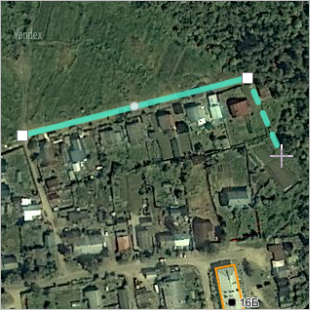 You may have to edit items if, for example, more detailed satellite images become available that let you draw a more accurate outline. Click the item on the map. In the attribute panel that opens, click Edit . — Undo. Cancels the last operation with that map item. Keyboard shortcut Ctrl + Z. — Redo. Repeats the last operation with that map item (in other words, it reverts the item back to its state before you "undid" the last operation). Keyboard shortcut: Ctrl + Y. You can delete a vertex to flatten out an item or make it shorter. Click on the appropriate vertex to open the context menu. Then click Delete. The vertex will be deleted. If the vertex is not a beginning or ending point, then the neighboring vertexes will join together to form a straight line. Click Save in the attribute panel. Your changes will be saved. You can move a vertex to correct your drawing of an item. Click on the appropriate vertex and your cursor will change to a “hand”. Then move the vertex to its new position. You can add a vertex to correct your drawing of an item. Click on the intermediary point (the circle-placemark) between two neighboring vertexes and your cursor will change to a “hand”. Then move the vertex to its new position. The point you move will turn into a new vertex. You can split an item if you need to add an attribute like a lifting gate (see section 3.3.1.7. 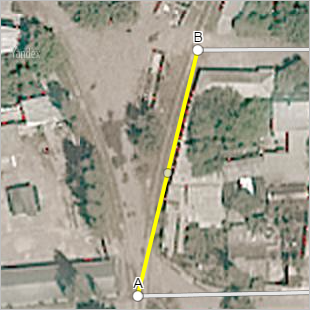 Rules for drawing road barriers) or video cameras (see section 3.8.3. Speed cameras). Click on the appropriate vertex to open the context menu. Select the Split before saving command. The vertex will be marked with the Scissors icon. You changes will be saved (the item will split at the point you selected). To rejoin the item (before saving your changes): click on the vertex marked with a “Scissors” to open the context menu. Then select Unsplit. 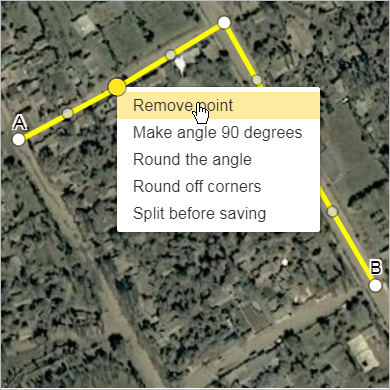 Making an angle 90° means that any bend in a line will transform into a right (90°) angle. Click on the vertex that needs to be straightened to open the context menu. Then select Make angle 90°. This will make it a right angle. Rounding a corner means that any bend in a line that is drawn using one vertex will transform into a rounded corner made up of three vertexes. Click on the vertex that needs to be rounded to open the context menu. Then select Round the corner. The corner will be rounded. Rounding all the corners works the same as rounding one, but the operation applies to all corners along non-straight lines: corners that are drawn using one vertex are transformed into rounded corners (drawn using three vertexes). Click on any of vertexes to open the context menu. Select Round off corners. All corners will get rounded. With simple linear items, you can also undo edits and send reports about an item to the moderator. These operations are used to delete map items.